Read about and build the fastest ship in the galaxy with this out-of-this-world kit! Join Han and Chewbacca aboard the fastest bucket of bolts in the galaxy. 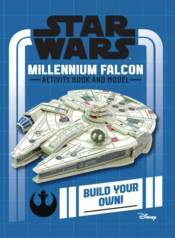 Packed with amazing puzzles and a Millennium Falcon of your own to build, there are hours of Star Wars fun to be had. Work out complete mazes, code words, and puzzles in the uniquely illustrated, full-color activity book. Then press out the pieces to create your very own mini Millennium Falcon model, perfect for re-creating famous scenes from the Star Wars saga. The model is made from a sturdy foam core. Press out the pieces to build the Millennium Falcon, with no glue required!